Saturday, October 1, 10 am. Ukulele Workshop for children and adults. MACC. Free! Saturday, October 1. 9 am – 4 pm. St. John’s KulaFestival. This popular upcountry festival includes entertainment, food, plant sale, craft sale, quilt show, silent auction, and fun for the kids. St. John’s Episcopal Church, Kula. $1 entry. Saturday, October 1. 11am to 3 pm. Sierra Club Maui 40th Anniversary Picnic. Come celebrate with food, music, environmental heroes award. canoe hale. Bring potluck deserts or side dishes (main dishes provided), chairs and the whole family. FREE! Kanaha Beach Park, Kahului. Saturday, October 1, 7 am – 2 pm. Maui Paddle For A Cure. Non competitive, fun open paddle to raise funds for breast cancer awareness. Hyatt Regency, Kaanapali. Saturday, October 1, 9:30 am – 12 noon. Walk A Mile In Her Shoes. Women Helping Women’s Annual Men’s March Against Domestic Violence. Men will walk a couple of laps in high heels in protest of domestic violence. $10 entry, fabulous prizes. Whaler’s Village, Ka’anapali. Sunday, October 2, 1 -6 pm. Maui Ukulele Festival. Enjoy listening to some of Hawaii’s finest ukulele players at this annual festival. MACC, Kahului. FREE! Tuesday, October 4, 9 am – 4 pm. Boot Camp with the US Patent and Trademark Office. Have you ever wondered if you should protect your business’s intellectual property, and if so, how? Free all day workshop and one-on-one sessions. Must preregister. Maui Research and Technology Center, Kihei. FREE! Thursday, October 6 – Sunday, October 9. 94th Annual Maui Fair. The premier family and cultural event of September with rides, first-rate entertainment, games, competitions, art and photo exhibits, horticulture and livestock shows, plant sale, chili cook-off, and opening parade. War Memorial Complex, Wailuku. Tickets: $3 for children 5 – 11, $5 - $7 for 12 and older. Prices subject to change. Friday, October 7 – Friday, October 14. Fall Sufi Camp. Annual fall gathering of meditation, yoga, seat lodge, dances of universal peace. Camp Keanae, towards Hana. Saturday, October 8. 10 am – 2 pm. Help Pull Fireweed out of the Park. Volunteer with Friends of Haleakala National Park to remove invasive fireweed and enjoy a short guided hike afterwards. Entry fee is waived for volunteers. Haleakala. Saturday, October 8. 10 am – 2 pm. Big Ink Celebration. Volunteer for a community printmaking extravaganza using a large steamroller. Contact the Hui ahead of time to bring your unique carved linoleum or MDF block to make sure it meets the requirements for being printed. Hui No’eau Visual Arts Center, Makawao. FREE! Saturday, October 8. 6 pm – 10 pm. Taste of Upcountry. Delicious “tastes” prepared by local chefs and farmers, drinks, silent and live auctions, contest and music. Benefit for Montessori School of Maui. Makawao. Friday, October 14 - Sunday, October 16. Hawaii Food & Wine Festival. 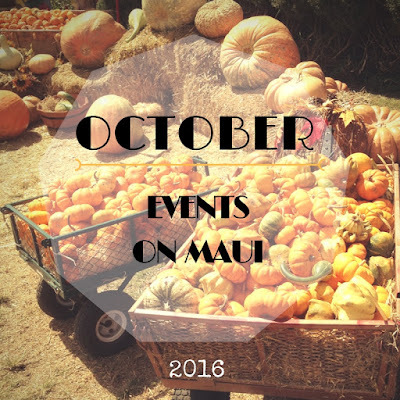 These dates are for the Maui portion of the festival which takes place on multiple islands. The festival features celebrity chefs, golf events, wine tastings, cooking demos, excursions and special dinners. Ka’anapali. Saturday, October 15. 9:00 am – 1:00 pm. La'au Lapa'au. Plant Healing Workshop with a native Hawaiian cultural practitioner. Learn the uses of Hawaiian plants and water for healing. Maui Nui Botanical Gardens, Kahului. $25/members, $50/guests (includes 1 year membership). Saturday, October 15. 10:00 am – 3:00 pm. 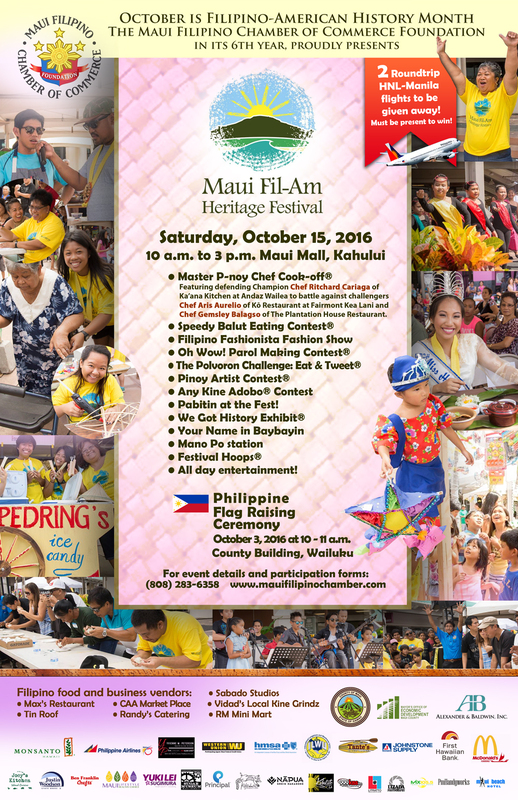 Maui Fil-Am Heritage Festival. 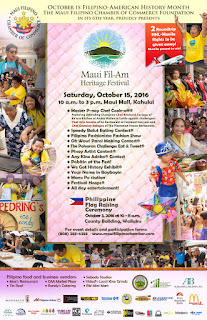 Celebrate Filipino culture in America and Hawaii with special cooking contests, fashion show, historical exhibits, the infamous speedy balut eating contest, and fun activities for the family. Maui Mall, Kahului. Saturday, October 15. 4:00 pm – 8:00 pm. Big Waves, Big Dreams. Private unveiling of art inspired by the “Big Waves, Big Dreams” theme at the epic “Jaws” House, formerly owned by waterman Laird Hamilton. Live music, cuisine, and lush ocean views. Winners of the art contest will be announced. Fundraiser for the Malama Family Recovery Center. Private estate, Haiku. $125 to attend the gala, $25 to enter the art contest. Sunday, October 23, all day, XTERRA World Championship. An elite off-road triathlon for professional and amateur athletes. Ritz-Carlton Hotel, Kapalua. Sunday, October 23, 9:00 am – 3:00 pm. Fall Harvest Festival. Craft fair, arts and crafts, petting zoo, food trucks, fun for the family. Haku Baldwin Center, Makawao. Free admission, $3 for parking. Monday, October 31 – Sunday, November 13. Aloha Classic Windsurfing Competition. Watch and/or volunteer. Hookipa Beach Park, Paia. Monday, October 31. Noon – midnight. 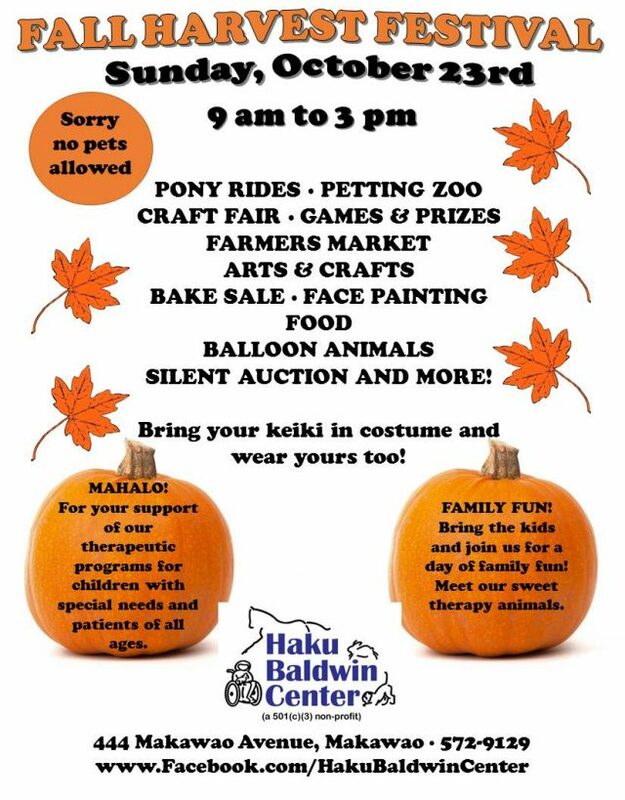 Halloween in Lahaina aka “The Mardi Gras of the Pacific.” Keiki events start at noon at Campbell Park with children’s games, from 4 pm - food booths will be available, costume contest starts at 6:30 pm. Front Street, Lahaina. FREE! Monday, October 31, 7 pm - 11 pm. Boochfest. An alternative Halloween festival for the entire family with a kombucha "booch" bar, live music, dancing, and costume contest. Makawao Union Church, Makawao. $20, free for kids under 10. Monday, October 31, 9 pm – 12:30 am. Halloween Variety Show Maui County Council Election Edition. The Maui Slam is hosting a performance art slam with the theme of the county election on Halloween. Bring your original piece to share and wear a costume. There will also be live art in creation, dancing, poetry, and a costume contest. Casanova, Makawao. Monday, October 31, 9 pm – 12:30 am. 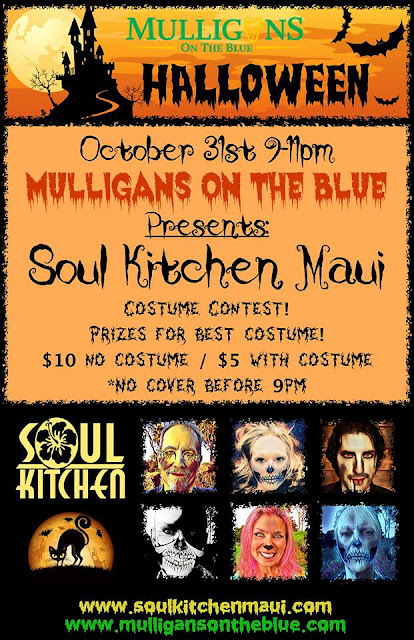 Halloween Costume Contest at Mulligans on the Blue. Costume Contest and live music by popular band Soul Kitchen Maui. $10 – no costume, $5 with costume, no cover before 9 pm. Sunday, November 6 – Saturday, November 12. Restaurant Week in Wailea. Dine out in style at Wailea restaurants, which offer a 3 course prix fixe meal at different price levels. Benefits the Maui Food Bank. Wailea. Tuesday, November 15, all day. Dine Out for Hospice Maui. Dine out at over 30 participating restaurants to help fund Hospice Maui.